This classic summer holiday destination has been quietly broadening its appeal beyond the bucket and spade brigade and has some fantastic options beyond the beach which agents could use to entice a new kind of traveller. Olympic Holidays’ Product & Commercial Director, Donna Allcock, says the majority of early bookings for summer 2019 are for four- and five-star properties, particularly for weddings and honeymoons. New hotels and refurbishments at old favourites such as the Annabelle (Paphos) are also driving interest. 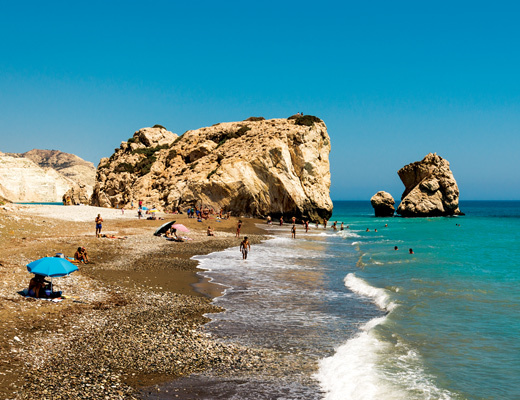 Last year was a record year for Cyprus with an 8.3% year-on-year increase in UK visitors to 1.25 million, and a 14.6% increase in global arrivals to 3.6 million. Rock falls, sharp zig-zag bends and not another car in sight – but the hire car’s sat-nav has to be kidding me! I’m on my way to the agro-tourism village Casale Panayiotis, but as I drive deeper into the mountains of the Paphos Forest, a night in the car looks increasingly likely. Driving round yet another bend, I’m suddenly treated to my first-ever sighting of a mouflon, its huge heavy horns curving around its pretty face. Shy and agile, the handsome local sheep is as elusive as its reputation. With a kick of its heels, it races off up the virtually vertical slope with ease and is gone. She turns out to be the only presence for miles. The only other local we encounter, striding out into the road, a gnarled walking stick in-hand, points to a mountain in the distance when I ask for directions. Tall pines, cedars and strawberry trees fade into dusk. Two phone calls later, we eventually make it to Casale Panayiotis, the result of one man’s vision to transform a crumbling village into a thriving tourism project. It is so worth the lengthy journey. Traditional crafts: From basket weaving to birdwatching and halloumi cheese-making to lace-making, visitors staying in Larnaka can enjoy a host of traditional activities for free. The daily programme, which runs from November to April, also includes a guided tour of old Larnaka and visits to a restored flour mill in the village of Athienou and the Mazotos Camel Park. Wine routes: Wine buffs can explore boutique wineries and family-owned vineyards on seven signposted wine routes. The routes take visitors through charming villages and the Troodos mountains, with wineries highlighted along the way. The Wine Museum in Erimi village outlines the island’s wine-making history, including Commandaria, the world’s oldest. Stepping out: A wonderful way to explore the island’s varied coastline, forests and mountains is on foot. The 52 designated walking trails, which vary in length and difficulty, include a variety of terrains, some passing by UNESCO Byzantine churches and cultural sites. Tee-time: With four top-class courses close to Paphos, Cyprus is a golfer’s favourite. The PGA National Aphrodite Hills Resort is undergoing a ˇ2.5 million investment, including rebuilding its greens and bunkers. The Sir Nick Faldo-designed Elea Golf Club has made its mark since opening. Secret Valley and Minthis Resort are the island’s oldest golf courses. Diving deep: An artificial reef and the 63-metre Elpida vessel sunken just off the coast of Larnaka are new attractions for divers this year. Warm waters (16-27C), clear visibility (thanks to the absence of plankton), a variety of wrecks, underwater caves and tunnels and an abundance of diving schools and sea life, including sea turtles, hold divers’ attention year-round. “Tourism is of course an extremely important sector for Cyprus and contributes greatly to our economy. Among the sectors currently showing growth are health and wellness holidays. Hotels: Two five-star hotels will open in March 2019: Parklane Resort & Spa – previously Le Meridien – in Limassol with 274 rooms, suites and villas, the Kalloni spa and a children’s park with water slides; and the Amavi , Paphos, with 207 sea-view rooms and a signature spa. Four new hotels will open in Larnaka this year and next: Radisson Blu near the port, Lebay Beach Hotel in Voroklini, Radisson Blu Airport and Conference Hotel, and Solaar Boutique and Spa Hotel. Palm Beach Hotel and Bungalows, Larnaka, has refurbished its spa and leisure club. The five-star Columbia Beach Resort, Pissouri, has reopened following extensive renovation, with 169 suites and a new Den Kids Club and Cub Life Creche in conjunction with Worldwide Kids Co. Projects: A 250m luxury Ayia Napa Marina development is scheduled to open in 2021 with apartments, villas, a 600-berth marina plus retail and dining outlets. Major works are taking place in Larnaka. The Municipal Market is being developed in an EU-funded project which will combine traditional stalls and artisan spaces with restaurants. The town centre is being made more wheelchair and pushchair accessible. A new gastronomic route of Larnaka’s mountainous area has been created where visitors can see traditional foods and crafts being made. Work is due to start this year on the 1,000-berth Larnaka Port and Marina development. Flights: Jet2 is flying weekly from Belfast to Paphos this summer. Cobalt Air now offers business class and economy on its six-times-a-week service from Gatwick to Larnaka. Sovereign Luxury Travel has a seven-night holiday at the five-star Parklane, A Luxury Collection Resort, Limassol, in October costs from £1,399pp on a B&B basis, including UK airport fast passes and lounge access, private transfers and flights from Gatwick with Thomas Cook. A seven-night holiday from Planet Holidays staying at the four-star Blue Ivy Hotel & Suites, Protaras, leads in at £572pp in May and includes B&B accommodation, scheduled flights from Heathrow and taxi transfers. The hotel is a five-minute walk from Sunrise Beach.